Goal! Tareq Khattab makes it 2-0 with a header! What a first half from Jordan! Goal! Jordan takes the lead on the breakaway! Musa Suliman strikes! Team News! Jordan boss Vital Borkelmans has kept faith in the side that defeated Australia. As for Syria, no Osama Omari in the side he has been ruled out for the tournament with a knee injury. Mardik Mardikian replaces him in the side. After missing the draw with Palestine through suspension, Mahmoud Al-Mawas has to settle for a place on the bench. The Jordan fans are in full voice! Kick-off is at 4:30 Mecca in Al Ain! 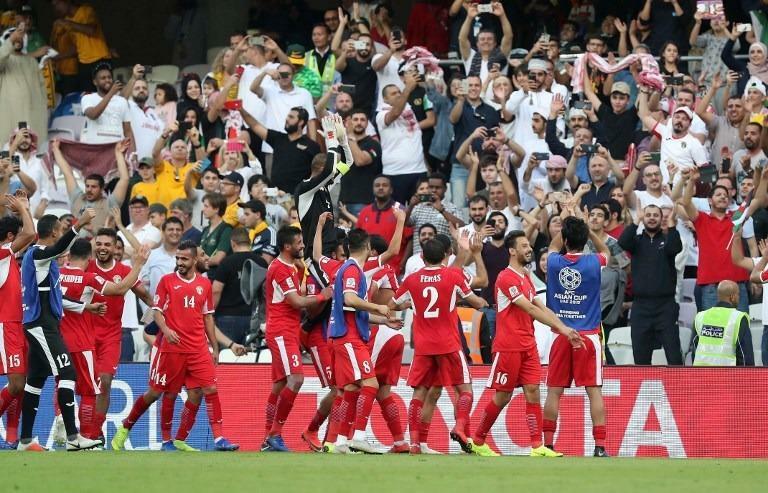 Jordan perhaps pulled off the biggest shock of the Asian Cup so far, defeating reigning Champions Australia 1-0 in their opening group game. I wonder if they can do the same today! This game has a derby feel to it as the West Asain neighbours come together in Group B. Syria boss Bernd Stange spoke before the game suggesting he was relishing the contest! "It's a derby, because the players know each other for many years. I have two players in my team playing in the Jordan first division and that's why it will be exciting. Good afternoon! Welcome to the Live Updates of Jordan Vs Syria! Can Jordan book their place in the round of sixteen with a win over Syria? Join me for all the latest build-up, team news, live commentary and Goals from the game in Al Ain!